Last night, I had biscotti for dinner. Not a biscotti after dinner. Nope, biscotti for dinner. I think I ate about five of 'em, gently dunking each one into an espresso. I'm not proud of it but I am strangely content about it. See, yesterday was another one of those court days. Court for immigration attorneys generally consists of two types of hearings- masters and individuals. Masters are basically a fast and painless check-in. On any given afternoon, there can easily be forty people in court for masters. Individual hearings are the real deal where the judge listens to the merits of your client's case. I've always felt that masters are more relaxed than individual hearings. But after yesterday's masters, I may have changed my mind. See, yesterday I had eight master hearings. Eight! On average, an attorney will have one, maybe two, and maaaaaybe three masters if things are particularly busy. Eight is just nutty. I now know what Jon and Kate on Jon & Kate Plus 8 must feel like (minus the hundreds of helpful cast people, of course). This particular judge does a roll call for attorneys to ensure they are present with all of their clients. He (and the entire court) got a good laugh when I stood up and indicated that I was present with my eight clients. So by the time I got home, I pretty much felt like a bus had rolled over me. Eight times. Oh, and don't worry, I looked it too. Somewhere between client four and five, my eyeliner started smudging so I was sporting the glamorous racoon-eye look. 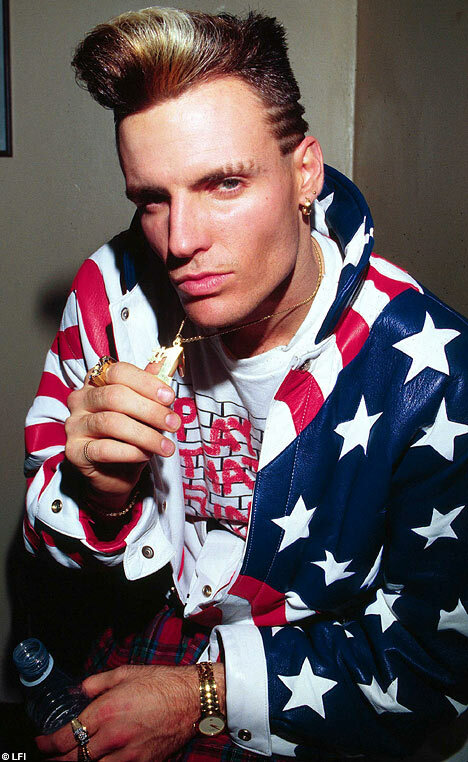 By client seven, my hair decided to rebel and do a Vanilla Ice thing on my head. And when I got back to the car and looked in the mirror, I noticed a giant yellow highlighter line on the side of my face (likely because I tend to wave my hands around crazily when I talk and sometimes, I forget that I'm holding a highlighter). Simply put, it was a dessert for dinner night. Not the kind of night where you eat a healthy dinner and then have a delicate biscotti as dessert. Oh no, drastic times call for drastic measures. This was the kind of night where you build dinner around biscotti. Thankfully, I'd made some biscotti over the weekend and some were still around (partially, or mostly, because the hubster is still on his healthy kick). I did what any rational girl would do. First, put on pajamas. All the better if the pajamas all plastered with your favorite cartoon character (I am partial to SpongeBob SquarePants). Second, make espresso. You want it strong (unless coffee keeps you up at night. After years of drinking copious amounts of coffee, I'm essentially immune to all caffeine. If you're not, milk is a sufficient substitute). Third, take the container of biscotti and the espresso to your computer. Plates are merely superfluous at this point. Fourth, type http://www.perezhilton.com/ into your browser. Fifth, revel in the latest celebrity gossip while eating your biscotti. Now that I have feeling in my brain again, I can talk about the intricacies behind the biscotti. Truth is, there are none. It's a rather simple recipe that will give you a giant batch of biscotti perfectly tailored to your preferences. Like the classic Italian anise flavor in your biscotti? Ground some anise seeds and throw them in the batter. Dream of a sophisticated biscotti perfect for the summer? Dump some grated lemon zest into the batter (save some zest for the topping). Want your biscotti to be a bit more cakey and not as crunchy? 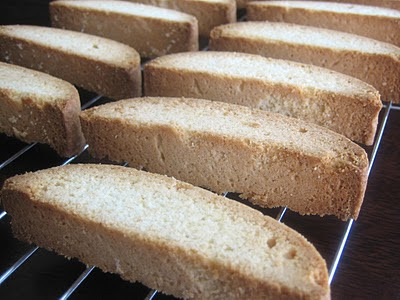 Bake for a shorter period of time after the biscotti are cut in pieces. Like different textures in your biscotti? Add chopped nuts or dried cranberries to your dough. Want to cover the entire biscotti in chocolate as opposed to just one half? Do it. You will be glad you did. Line a heavy large baking sheet with parchment paper. Whisk the flour and baking powder in a medium bowl to blend. 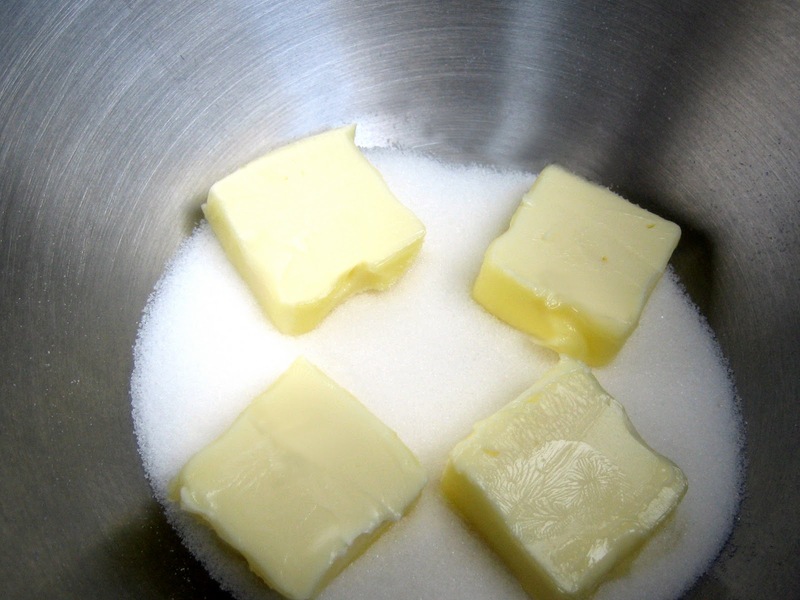 Using an electric mixer, beat the sugar, butter, and salt in a large bowl to blend. Beat in the eggs 1 at a time. Add the flour mixture and beat just until blended. Form the dough into a 13-inch long, 3-inch wide log on the prepared baking sheet. Bake until light golden, about 40 minutes. Cool for 30 minutes. Place the log on the cutting board. Using a sharp serrated knife, cut the log into 1/2 to 3/4-inch-thick slices. Arrange the biscotti, cut side down, on the baking sheet. 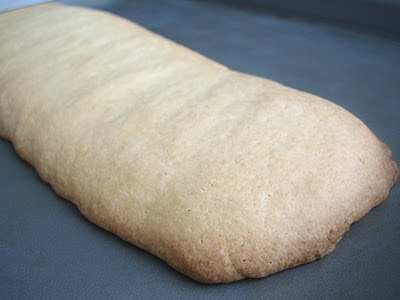 Bake the biscotti until they are pale golden, about 15 minutes. Transfer the biscotti to a rack and cool completely. Stir the chocolate in a bowl set over a saucepan of simmering water until the chocolate melts. Dip a portion of the biscotti into the melted chocolate. Gently shake off the excess chocolate. Place the biscotti on the baking sheet for the chocolate to set. Sprinkle with chopped almonds. Refrigerate until the chocolate is firm, about 35 minutes. The biscotti can be made ahead. Store them in an airtight container up to 4 days, or wrap them in foil and freeze in resealable plastic bags up to 3 weeks. I've done desserts for dinner too after a stressful day! Those biscotti look terrific! looks great! props on keeping it simple. I can't imagine how you do it...8 clients? That must have been 100X harder than dealing with one kid and I can barely pull it together when it comes to her. There is nothing wrong with biscotti for dinner but I have to say that if I'd been in court all day you better believe I'd get into my pajamas and eat store-bought biscotti. There is no way I'd have the energy to make homemade ones! But they look worth the effort. Hope today is a less stressful day! Your biscotti looks beautiful...I would want to eat it for dinner too. I'm enjoying hearing about your experiences as a lawyer. I've considered going to law school, and it has been so informative to hear about your days. Thanks for sharing! I'm not judging you because biscotti and coffee would be a most enjoyable dinner for me! Ice cream. Or sometimes I come home and just bake and eat raw dough and cake batter for dinner. A long day of legal stuff really requires the dessert to wind down, so no judgment here. And those are beautiful biscotti ESPECIALLY cause there is no anise--I hate anise. You had a tough day indeed! I couldn't imagine 8 cases in one day especially when you compared with Jon and Kate plus 8! I would have these beautiful biscotti for dinner too! They are so inviting. So no judgement, go for it girl! I think it's a big "aha!" moment when we adults realize that it doesn't matter what we eat for dinner. It dawned on me a few years ago that no one will zap me if I choose to eat cereal or ice cream for dinner. I don't make a habit of eating rebellious foods for dinner, but I no longer feel guilty and neither should you! Oh my that sounds like a dream. The perfect ending to an awful day, or a good day, or any day! Your biscotti look so good...my mom would love these, so I am definitely bookmarking the recipe. Thanks! :) And, I am all about an indulgent treat after a hectic day. The biscotti looks wonderful. Eat what you like, when you like. Makes life less stressful. YESS! Hooray for biscotti for dinner!! I've actually always wanted to learn how to make biscotti -- mainly because it's one of my Mom's favourites, and I'd always wanted to make a batch to surprise her one day. Unfortunately my baking skills seem competent enough only to carry me through to the almost effortless no-knead bread. Sigh. One day...! no judgement AT ALL. i just had a carrot cake cupcake for dinner. sounds like a stressful day! Oh my, eight clients in one day!? You deserve to have all the biscotti you want for dinner plus a couple scoops of ice cream with a cherry on top. Talk about a hectic day. I don't know if you got my reply on coffee- but 3 cups in the morning is the only way to go. Plus all the info on how coffee is bad for you is substantial, there is no proof that drinking more than 1 cup of coffee a day will be detrimental to your health. I fully support the 3 cups at breakfast. It's funny you post about biscotti because just yesterday I was at the coffee shop and asked my mom "Does anyone actually like biscotti?" I've never had it in the correct way (meaning dunked in espresso) so maybe I should stay a little more open?. I'm envious of your pictures!!! You day sounds horrific! My brother in law is a lawyer so I kinda can imagine how crazy things must be for you. It definitely was a dessert-ice cream-bring on the sugar kinda day! 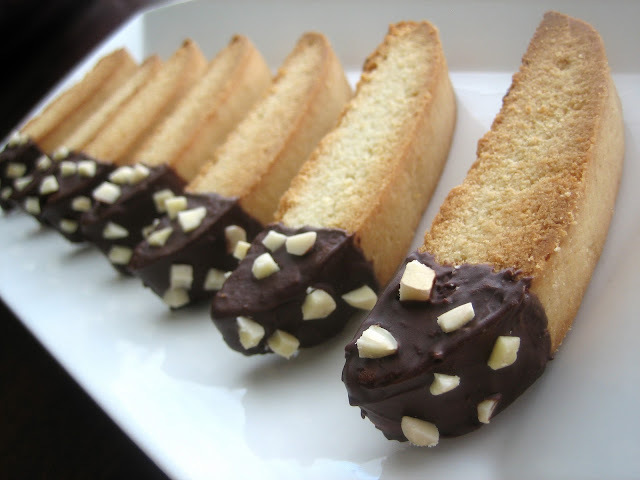 The biscotti look amazing and I like the touch of chocolate on the ends! Beautiful biscotti - a comforting reward for making it successfully through a rough day. I assure you that there's absolutely nothing wrong with that. Your biscotti looks great! I love biscotti too. Definitely my favorite! Taiyyaba- Thanks! I like simple (and delicious)! Monet- Law school and being a lawyer are nothing like what I imagined they'd be but it's definitely been interesting. What sort of law are you considering? Az- I've heard about CPA exams. They sound almost as bad as bar exams so I'm sure you know exactly what I'm talking about. BB- I hate anise as well. Must be a lawyer thing. Baking- My mom loves 'em as well. She's totally taken over the recipe. I think your mom will love them too. Let us know! Lazaro- I like your stance on things! Fathima- Thanks for stopping by! Some desserts look best when they look homemade but unfortunately, biscotti just looks wonky so I'm glad you think this looks store bought! Lequan- Ice cream would have also been very good but we didn't have any at the time. We really need to have a better emergency supply plan! Housewife- I feel for your brother in law (and his significant other, if he has one). In hindsight, the day probably warranted a lot more chocolate on the biscotti! My Carolina- Thanks, it's so refreshing to read that! What an INTENSE day... you earned that biscotti! Unapologetically! Such a coincidence you posted about this. I don't think --stress think-- that I would be a biscotti person. I am, however, a HUGE coffee fan, and lately, as I stand in line at various coffee shops, I wonder... should I get a biscotti? It almost calls my name. You've inspired me! Maybe I'll take the plunge. Thank you! No judging :) Your day sounds hectic- I have been known to at least do dessert first if not just dessert! I think biscotti dinner sounds pretty good :) Last night it was midsummer here in Sweden, lots of food and friends and fun (and drinks!) Happy midsummer form the north! I'm partial to popcorn for dinner, followed by ice cream straight from the Ben & Jerry's container after a long day. Your bicotti look like an excellent substitute! Big girls eat what they want for dinner! Go girl!! Love the biscotti you made, it looks very filling! you have every right to eat biscotti for dinner :)I bet it was good. It is good to know that I am not the only one that comes home from work and eats dessert right away. Sugar always soothes my stress, we are good friends. :) Oh, and putting on the PJs must occur immediately after walking in the door too, yeah, my routine is pretty much the same as yours! Hi there - Thanks for the kind comment on my blog. I've been hitting Coldstone Creamery recently for ice cream for dinner, but your baking looks even better! Highlighter on your face made me laugh. I used to read with pen in hand, leaning one hand on my chin, and would often come home with blue streaks all over me. Work hazard, I suppose. wow, sounds like a busy day but those biscotti sound like the perfect bite after a long day! These look great!! There is def. a difference between store bought biscotti and home made ones. Yours def. looks better than any store bought ones! Wow, this biscotti looks delicious. I really don't make it as much as I should but when I do make biscotti I use this Brownie Biscotti recipe. Thanks for sharing yours! This is making me want to eat biscotti for breakfast, lunch and dinner. If I had some on hand, that is what I'd be doing for the rest of today. These look so beautiful--they look perfectly dunked in chocolate! I've heard that traditional biscotti recipes don't contain butter, but they're hard to find! Have you ever tried a recipe that doesn't use butter?